We have counseled more than 60 airports—large and small—in connection with the development and implementation of comprehensive noise management, mitigation, and abatement programs. We frequently advise clients on strategies for implementing noise rules and on developing programs for preferential runway use, noise abatement departure procedures, and related voluntary noise abatement programs. 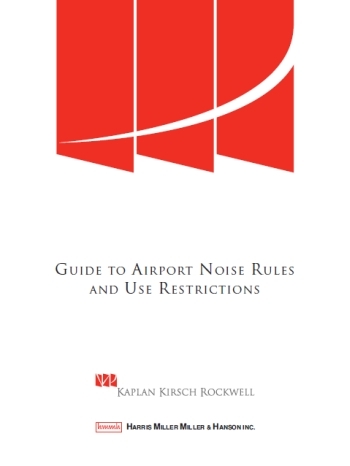 Kaplan Kirsch & Rockwell has provided continuing counsel to airport proprietors, local governments, and community organizations on the noise impacts of aircraft flight tracks and routes, on minimizing the impacts from changes in flight tracks and routes, and on modifications of flight tracks and routes for noise management purposes. We have assisted in preparing and updating noise compatibility studies under FAR Part 150 at airports throughout the country. Recently, we were called on regarding the noise implications of new NextGen flight procedures and the rerouting and concentration of aircraft flight tracks in several metropolitan areas. Our attorneys have been leaders in the area of noise rules before and after enactment of the Airport Noise and Capacity Act of 1990 (ANCA) and its implementing regulations, FAR Part 161. We also represent municipalities and other local governments affected by airport operations in negotiations and litigation over management and mitigation of airport impacts and the equitable allocation of the burdens and benefits of airport development. Our representation of these government clients calls upon our expertise not only in airport legal issues, but also in related matters such as land use regulation, local government law, constitutional law, and federal and state environmental programs. Additionally, we have successfully defended several nuisance and takings cases for noise damages in state and federal courts brought against airport sponsors. Counseled sponsor of a major hub airport on legal recourse when FAA’s new NextGen flight patterns introduced noise for the first time to highly urbanized historic and low-income communities. Assisted in the drafting, enactment, and defense of litigation against the only new noise rule adopted in the United States since enactment of the Airport Noise and Capacity Act (ANCA) in 1990. Prepared legislation and defended regulation in federal courts and in administrative proceedings a curfew adopted by a general aviation airport in a resort community in the Northeast. Assisted in preparation Part 150 noise compatibility plans and studies for airports in Kentucky, Florida, California, and Washington. Counseled, advised on regulatory compliance, and negotiated with airlines for extension of a terminal use agreement for an airport in the Northeast which resulted from noise litigation brought by neighboring communities. Successfully secured legislative exemptions from ANCA for clients in the Midwest and Rocky Mountain states and secured favorable rulings from FAA on the extent of ANCA grandfathering for another airport in the Northeast.